There’s something infinitely attractive about the Calvin Klein aesthetic. Beautifully youthful and toned models shot Herb Ritts-style in black and white, whilst sporting nicely-fitting undergarments, or tailored jeans, in plain colours. 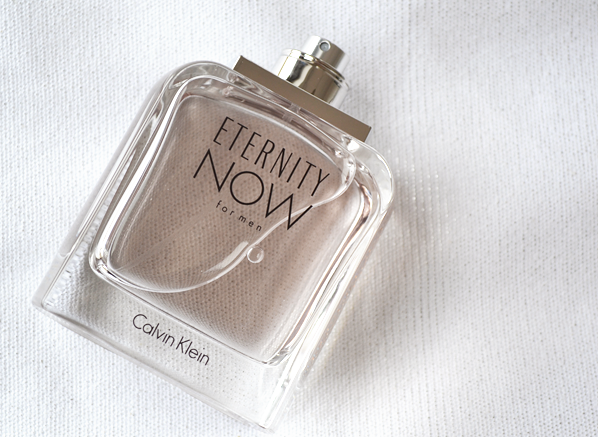 There’s a cleanliness and healthiness to the simplicity of the execution of all things Klein, and this can be seen with the brand’s latest offering: Eternity Now, two flankers (one feminine and one masculine) to Calvin Klein’s legendary Eternity fragrances. Eternity Now takes inspiration from the very beginning of a relationship – that one moment where anticipation bursts and one realises that forever may just be on the cards. 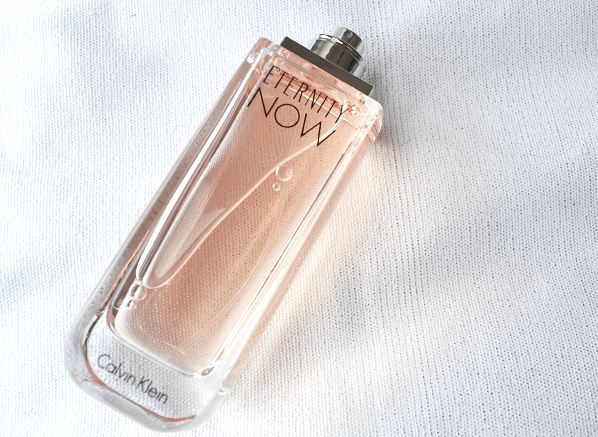 “Forever starts now” says Calvin Klein, and the two fragrances have been designed to recreate that moment of joy, of excitement and of freedom at the very start of a relationship. These fragrances are that initial spark. 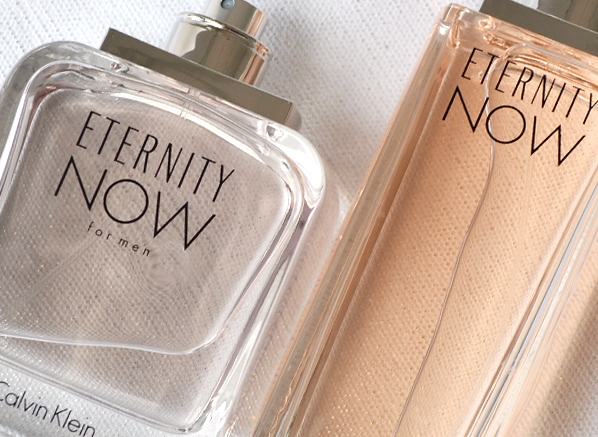 Eternity Now For Her is described as “luminous – lush – sensuous” – a blooming peachy floral that represents the promise of new love, and For Him is a contemporary fougére “with undeniable masculine appeal”. Both scents are youthful, fresh and quite a lot of fun! Eternity Now For Her strikes an interesting balance. On the one hand it feels sparkly and glitzy, like a party dress made from rose gold-coloured fringe, whilst on the other it has a laid back soapy character that is clean and fresh. Technically, this would be classified as a fruity floral, due to its overdose of peach and musk however, there’s something a little bit darker underneath that may just hint at an attempt at a modern chypre (patchouli perhaps), albeit in a very subtle manner. Whatever Eternity Now For Her is classified as, it’s most definitely a fun and fancy-free blend of flowers and fruit coloured in blush tones. The fragrance opens with a blast of mouthwatering peach. At first, one gets the impression of biting straight into a juicy piece of fruit however, the effect quickly turns soapy and clean, hinting at a gorgeously peachy bubble bath with green undertones. As it settles, For Her pulls on a cashmere towel of woods and musk, laying back into velvet soft fabric and revelling in her shower-fresh cleanliness. This is a perfect fragrance for those days when all one wants is to smell clean and unfussy, but zesty and lively enough to exude personality. Fresh, fun and frivolous, that’s Eternity Now For Her. Eternity Now, the gentleman’s version, interests me for two reasons; a), because it’s a fougére, and there’s nowt nicer on a gent than a fougére; and b), because it’s an intriguingly modern take on the genre. Fougéres usually consist of a blend of lavender, coumarin (a compound found within tonka beans) and oakmoss. The results of this blend can range from rugged gents in designer suits (Rive Gauche Pour Homme by YSL) to barbershop quartets with rippling muscles (Le Mâle by Jean Paul Gaultier). Eternity Now however, is a sticky tropical fougére with an industrial undercurrent of metallic tones. I told you it was interesting. The fragrance starts out relatively sweet but it would be fair to say that a lot of the sugar is front-loaded, meaning that things gradually become drier as time progresses. The opening is a syrupy cocktail of coconut water and star anise, sharpened by the zesty freshness of ginger, which is applied with a big squeeze. At the bottom of the cocktail glass, as it were, lies all of the warm fougére tones, plush notes such as vanilla, coumarin, cedar wood and patchouli which altogether, make for a smooth finish. Eternity Now for him is a relaxed fougére for the modern man who wears jeans rather than a suit, and frequents the gym, rather than gentleman’s club. It’s a new breed entirely. This entry was posted on Wednesday, October 7th, 2015 at 5:07 pm and is filed under Candy Perfume Boy, Fragrance, Men, Tried & Tested. You can follow any responses to this entry through the RSS 2.0 feed. You can skip to the end and leave a response. Pinging is currently not allowed.